For this comparison, while the 13-inch and 15-inch MacBook Pro can be upgraded at the time of purchasing, we will largely concentrate on the base models of each size. For those who have already decided to acquire a 13-inch model, AppleInsider has previously examined the pros and cons of getting it with and without the Touch Bar. The base 15-inch model costs $700 more than its 13-inch stablemate, but what does that extra cash get you? The 15-inch MacBook Pro has better speakers, a larger trackpad and a slightly higher resolution display which you probably won't notice without a closer inspection. Of course, the 15-inch model is quite a bit larger, as the name implies, and weighs an extra pound over the 13-inch version, making it a bit less portable. In our personal experience, the 13-inch version is a lot more comfortable to carry around and use, especially when it's on your lap, or on a cramped airplane seat. The 15-inch version, however, is better for long sessions at the work desk thanks to the larger screen. It is also equipped with an 87-Watt power adapter for the larger battery, to help it charge at roughly the same rate as the smaller model. Despite the size difference, battery life on both devices is rated at the same 10 hours. Both models come with all of the same new features, like Bluetooth 5, True Tone display technology, an updated butterfly keyboard, and Apple's custom T2 chip. The Touch Bar is literally identical on both models as well. The first major difference that can easily make up your mind is that the base 15-inch model comes with twice the RAM in the base model, and it's faster DDR4 RAM as well. You'll have to pay an extra $200 to get the 16-gigabyte upgrade on the 13-inch, but it's still slower LPDDR3 RAM. Both base models come with a 256GB SSD and there's practically no difference in speed. Unlike last year, all four Thunderbolt 3 ports on the 13-inch model now run at full speed, but it's packing an integrated graphics chip so it can't drive two 5K displays like the 15-inch version can. There's a huge difference in Geekbench 4's graphics test, and an even bigger difference in the Cinebench R15 graphics test, but that test is also limited by processor performance. Both models come loaded with Intel's 8th-generation processors, but for the first time ever, the base 15-inch model packs a six-core i7 CPU. There's not a huge difference in single-core performance, since base and turbo boost clock speeds are somewhat similar between the two, but the 15-inch MacBook Pro shines in Geekbench 4's multi-core test, thanks to the extra two cores. We stress-tested the processors by running Cinebench R15 back-to-back to let the processors heat up, and for the cooling system to run at capacity. The 15-inch model scored an average of 991 points, a massive 307-point lead over the 13-inch model. If you're going to be doing tasks that constantly tax your Mac's processor, you're getting about 45 percent more performance for 33 percent more cash. Another batch of tests were done by editing video in Final Cut Pro X, which uses both the CPU and graphics together for the most realistic performance results. There is a massive difference when exporting a 1 minute 4.5K Red RAW clip with added effects, with the 13-inch taking 7 minutes and 37 seconds, while the 15-inch took 2 minutes and 11 seconds. For a 5-minute 4K h.264 clip with added effects, the 13-inch model took almost 3 times as long to finish the export, completing in 11 minutes and one second compared to the 15-inch MacBook Pro's 3 minutes and 44 seconds. . Stabilizing a 4K clip also took way longer on the 13-inch MacBook Pro, at 39 seconds versus 14 seconds, making the 15-inch model an obvious choice for anyone who performs a lot of stabilization of video in Final Cut Pro. We also tested the BruceX Final Cut Pro benchmark, and again, the 13-inch model took almost twice as long at 1 minute 24 to the 15-inch's 46 seconds. Based off those tests, the base 15-inch MacBook Pro is the obvious choice for video editors. We also noticed the 13-inch MacBook Pro's 8GB of RAM was constantly consumed, making the situation worse for that model. However, there may be a saving grace for the 13" MacBook Pro, in the form of the Blackmagic eGPU. It's basically a Thunderbolt 3 enclosure that holds a powerful graphics card and connects to your MacBook Pro to boost graphics performance, and based on Geekbench 4's graphics test, it's much more powerful than the 15-inch MacBook Pro's GPU. In a repeat of the Red RAW export, the 13-inch MacBook Pro with eGPU was more than twice as fast, while the five-minute 4K export was almost three times faster than before. For the stabilization test, the eGPU helped the 13-inch model effectively match the speed of the 15-inch model, and performed the BruceX benchmark faster than the 15-inch MacBook Pro. Although the 13-inch MacBook Pro with the Blackmagic eGPU doesn't quite match the 15-inch version by itself, it still greatly improves performance compared to the 13-inch model working alone. This combination will cost you $2500, that's $100 more than the base 15-inch model which still has more processor performance and double the RAM. Not to mention, the eGPU is meant to work with an external display, and it's the first one that supports LG's Ultrafine Thunderbolt 3 4K and 5K displays. If you're not planning on buying one of those two monitors, there are definitely cheaper eGPU options out there that pack a similar RX580 graphics card, or you can get a Vega 56 or 64 like the iMac Pro if you're prepared to spend a little money. If portability is a big deal for you, an eGPU may actually be a viable option for great performance at home. If you don't care about portability, the 15-inch MacBook Pro will definitely pack the performance you need for any processor or graphics intensive task. On the other hand, if your workload doesn't include graphics intensive tasks like video editing or 3D animation, then the 13-inch MacBook Pro will probably get the job done, albeit at a slower pace than the 15-inch model, but you will also save a fair bit of cash. 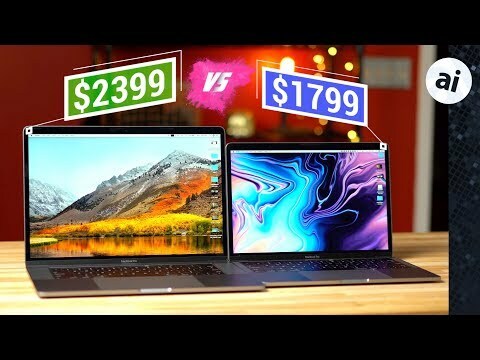 Looking to buy a 2018 MacBook Pro? Save $75 on all 13" Touch Bars and $100 on all 15" models with coupon code APINSIDER at Adorama when used with this pricing link. For the lowest prices across all Macs, please visit our Price Guides for the latest deals and product availability. The maxed out 13” (at least maxed RAM and processor) adds $500 but almost specs it out the same as the base or even mid-level 15” (albeit with LPDDR and a 4 core i7). It would be interesting to see if, for about the same price as the base 15”, the performance is close enough between the 2 to make portability worth choosing the 13”. Thanks for the tests! Very nice review for us techie types. Okay, so how does the average Apple Store employee help a less technically savvy buyer choose a MacBook that fits their needs when there is such an overlapping array of different configurations within specific price bands, say $1500, +/- $200. On several occasions, including just last evening, I've been in an Apple Store and see regular people throwing themselves on the mercy of the Apple Store employee by asking/begging the employee something along the lines of "I'm asking you to tell me what I need to buy." They don't look happy, they look kind of lost and befuddled. I've also helped people with Apple product purchases, mostly because these people felt intimidated by going into the Apple Store on their own. I'm not saying that every Apple Store has a certain hipster vibe to it, but it is definitely intimidating for some people with the roiling mass of humanity and noise that occurs at times. Sure, the worst Apple Store is still infinitely better than the used car salesman approach you'll experience at other computer/electronics stores, e.g., Microcenter, or the depression inducing gloom of a dying Best Buy, but it is still tough for some folks and the Apple Store employees have to find a way to connect and communicate the right things to keep the folks from panicking and make sure they leave the store with a new Mac and happy. So, how do Apple Store employees explain the differences and help guide a buyer with $1500 (or $2500) to spend on a MacBook to the right model for the specific buyer? Steve Jobs is famously quoted with "Technology Alone Is Not Enough." If Apple's products are truly bringing together technology with the liberal arts and humanities, how does this aspirational goal translate into making sure customers will walk away from the Apple Store with more than just a big hunk of slick technology in a stylish bag? The readers of AI are no doubt wowed by hyper threading and benchmarks and gigabytes, but what about the other 90% of Apple's customers? I'd love to see AppleInsider do some field work to gain some insight into some of these questions. It sounds to me like Apple Store employees have an incredibly difficult job to do, and they're supposed to be the ones "in the know" with the right answers to the questions that vastly less knowledgable prospective customers are asking. You mentioned "there are definitely cheaper eGPU options out there that pack a similar RX580 graphics card" - can you do a post on how to build and configure one of these for dummies? If you could repeat the same tests with a 13“ 16GB model, that would be hugely informative - thank you very much! It’s the one extra any professional would opt for anyway. i7 gives you some 7% more processing power, so it doesn’t really matter, but if the system is constantly swapping due to a lack of RAM, it could be day and night. Mobility is a concern of mine, so I compared a higher spec 13" i7 2.7GHz (4-core) with a lower spec 15" i7 2.2 GHz (6-core). Both with 16GB RAM and 512GB SSD. The Geekbench benchmarks are quite close, with the single core performance of the 13" 2.7 GHz better than the 15" 2.2 GHz (naturally). Of course, the multi-core of the 15" were better. However, the 13" was $100 cheaper, and I would still get good performance while on the road, so I'm thinking that might be the sweet spot for me. edit: For mobility/performance, I realize the AI recommendation of a 13" with eGPU is about the same $$ as my high spec 13", and that is a very interesting option. I was looking to be able to have a relatively high level of performance when mobile.